Can you quickly pick out early flu symptoms—those first signs that crop up? Learn how to tell the difference between flu symptoms vs. cold symptoms in both children and adults. Early flu symptoms often involve fatigue, muscle ache, and/or scratchy and sore throat. Every year, between 5 percent and 20 percent of the U.S. population contracts the influenza virus, tens of thousands are hospitalized, and thousands die from flu-related illness, according to the Centers for Disease Control and Prevention. Therefore, it’s critically important to recognize the first symptoms of flu—and seek medical attention quickly. Waiting for the flu “to pass” can be dangerous, especially in children, older adults, or adults with respiratory or immune-compromised conditions. Fatigue. A sudden feeling of overwhelming fatigue may appear before other symptoms. While fatigue is also a symptom of the common cold, it is usually more severe with the flu. Scratchy or sore throat. In the earliest stages of the flu, your throat may feel irritated, scratchy, or sore. You’ll notice this sensation more when trying to swallow foods or drinks. Muscle aches and joint pain. Body aches are also an early warning sign of the flu. Many flu sufferers describe the aches similar to the pain experienced following an intense workout. Stomach woes usually aren’t part of a flu illness. But some people with flu symptoms do experience nausea, vomiting, or diarrhea. Such gastrointestinal issues are more common in children than adults (see sidebar). Dehydration symptoms. Dehydration is a dangerous complication of the flu. To avoid dehydration, drink water, herbal teas, or broth. Children can drink water or Pedialyte. If you or a loved one have one or more flu symptoms, contact your doctor as soon as possible. 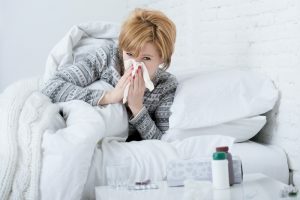 Tamiflu is the preferred treatment for the flu; however, Tamiflu is effective only within the first 48 hours of contracting the influenza virus. If you wait to go to the doctor, Tamiflu may no longer be an option for you. Aside from taking Tamiflu, the best way to mitigate the effects of flu symptoms is to take measures to decrease the symptoms. For example, you can take over-the-counter pain medication such as acetaminophen (Tylenol) to fight fever as well as body aches and pains. You also can gargle with a mixture of warm water, salt, and baking soda to alleviate sore throat, or try drinking warm herbal teas. Lastly, try utilizing one or more natural flu remedies listed here. You can also try a product called Boiron Oscillococcinum, a homeopathic remedy that has been found to help alleviate flu-like symptoms. Another product, Sambucol Black Elderberry Cold & Flu Relief, has been found beneficial in naturally relieving both cold and flu symptoms. Remember, the flu is nothing to take lightly! If you or a loved one is suffering from influenza, take actions immediately to reduce the intensity and duration of your symptoms. aches and pains, allergies, baking soda, bronchitis, chest discomfort, children, cold and flu, common cold, congestion nasal, dehydration, dehydration symptoms, diarrhea, dizziness, early flu symptoms, elderberry, eye pain, flu, flu like symptoms, flu relief, flu remedies, flu treatment, gastrointestinal, germs, headache eye pain, homeopathic, how long does the flu last, immune system, joint pain, muscle, muscle aches, muscle aches and joint pain, natural flu, natural flu remedies, natural remedies, pain, pain medication, pains, pneumonia, shortness of breath, skin, sore throat, stuffy nose, supplements, symptoms of the flu, virus.